New York’s electricity policymakers were very busy in 2017, setting a U.S.-record offshore wind target, devising an outline for pricing carbon into wholesale markets and facing down legal challenges to efforts to rein in energy service companies and its nuclear subsidies. The state also agreed with Entergy on the staggered closing of its 2,311-MW Indian Point nuclear plant, which will retire the second of its two remaining generators in 2021. 2018 will be eventful as well. Storage targets will be mandated early this year, the technical details of carbon pricing will be ironed out in conferences and public hearings, and a master plan for offshore wind will be released. The IPPTF will next meet Jan. 8 in Albany. ZECs are part of the state’s Clean Energy Standard, which mandates reducing greenhouse gas emissions by 40% by 2030, from a 1990 baseline, and by 80% by 2050. It also calls for renewables to meet 50% of the state’s energy needs by 2030. In July, a federal judge dismissed a challenge to the ZEC program by the Electric Power Supply Association and several of its members. The year began with Gov. Andrew Cuomo reaching an agreement with Entergy on his long-sought goal of closing the Indian Point nuclear plant, which the governor worries is too close to New York City. Under the deal, Units 2 and 3 will be deactivated by April 30, 2021. The agreement would allow the plants to operate for two additional two-year increments — with final closure slated for 2025 — if an emergency affected reliability in the New York City area. Unit 1 was shut down in 1974. 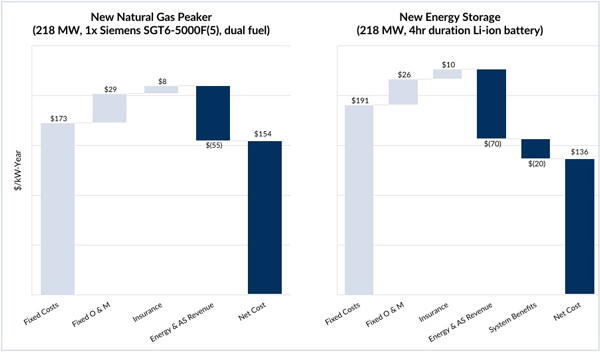 NYISO reported in December that gas-fired and dual-fuel generation coming online in the next few years will be enough to maintain reliability after the Indian Point closure. 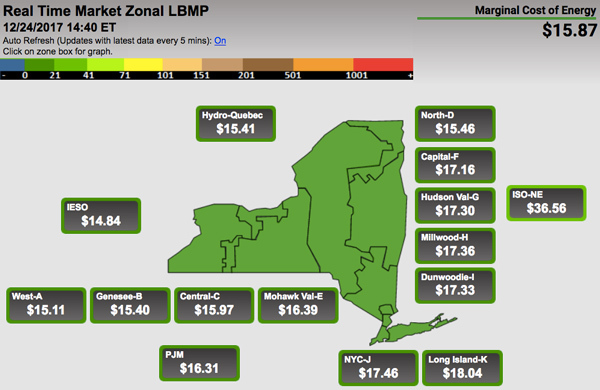 New York’s utilities will use 2018 to continue developing the analytical tools to deal with distributed energy resources and transition from a one-way transmission system to a multidirectional grid. The ISO’s DER Roadmap, issued in February 2017, outlines the grid operator’s plans for integrating DER into its ancillary services, capacity and energy markets over the next five years. In July, the commission expanded and extended Consolidated Edison’s Brooklyn-Queens Demand Management project and in August approved a Con Ed solar project dedicated exclusively to low-income customers. The PSC also faced legal challenges to its December 2016 order banning energy service companies (ESCOs) from serving low-income customers unless they obtain waivers by guaranteeing reduced bills or other benefits (Case 12-M-0476). State and federal courts temporarily blocked the ban on several occasions during 2017. In November, the 2nd Circuit denied a motion for a stay pending appeal. On Nov. 22, the PSC issued an order setting dates for implementation of the December 2016 order on a rolling basis as contracts expire. In the meantime, the commission approved waivers on about half of the dozen requests it received from ESCOs. In December, NYISO released a report detailing its plan for opening its wholesale markets to storage. The ISO report, “State of Storage: Energy Storage Resources in New York’s Wholesale Markets,” lays out three stages to facilitate storage participation — integration, optimization and aggregation with other DER. The ISO will allow storage resources to provide all the grid services that they’re capable of, while also reducing the minimum participation size from 1 MW to 0.1 MW. The ISO plans on having storage market rules ready for commercial use in 2020. The PSC in May took actions to allow large commercial batteries in New York City, and in December approved a three-year, $7.5 million pilot program for Con Edison to control its New York City customers’ air conditioners to help shave peak demand in summer. Con Edison also is working with various companies on demonstration projects to use storage and software to shave peak demand. 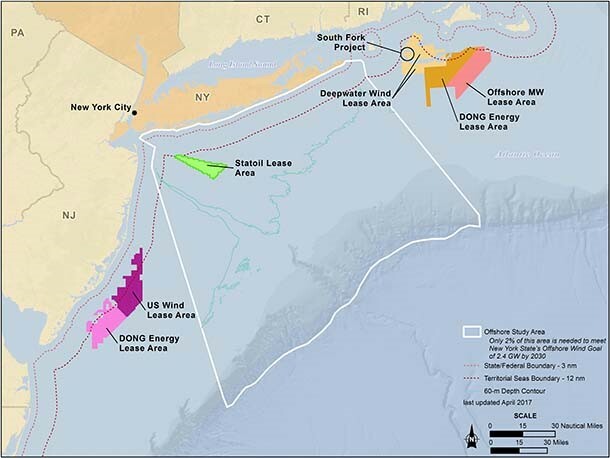 The first offshore wind lease for New York, a nearly 80,000-acre site off the Rockaways in Queens large enough to generate up to 1 GW, went to Norway-based Statoil in December 2016. 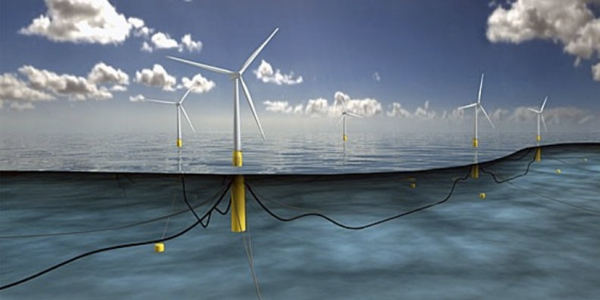 Statoil says the project, which it has dubbed Empire Wind, is in early-stage development. It hopes to sign a power purchase agreement with a U.S. utility for the project by the end of 2018. The first project in the water could be the 90-MW South Fork Project off Montauk, which was approved by the Long Island Power Authority in January. Developer Deepwater Wind says construction could start as early as 2019, with the wind farm operational as early as 2022. 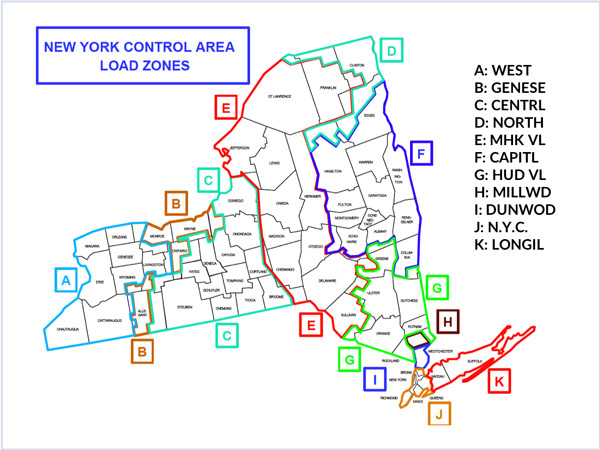 The New York State Energy Research and Development Authority is drafting a master plan that will include an offtake transmission element, the crucial part of getting wind-generated power to shore. The master plan will include a timeline and recommendations on how to speed up the offshore planning and permitting process.